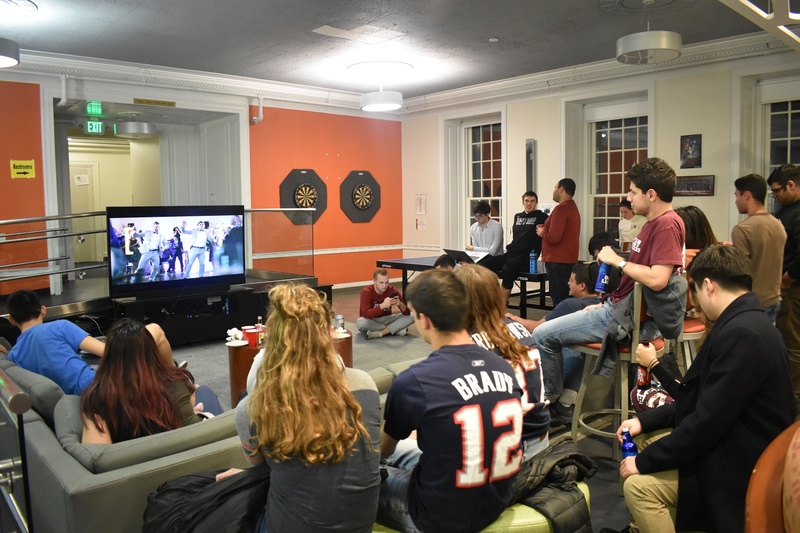 Students watch Super Bowl LIII at a watch party hosted in Pforzheimer House. Munching on mozzarella sticks, drinking beers, and cheering loudly for their teams, students crowded into common rooms and dining halls across campus to watch the New England Patriots take on the Los Angeles Rams in the Super Bowl Sunday. Though the game itself marked the lowest scoring championship in National Football League history, some students said they enjoyed watching Patriots quarterback Tom Brady win his record sixth title — or hoping to see him lose. Many took a break from papers and problem sets to watch the game. Several students said they hoped the underdog Rams would topple the Patriots, who have played in three of the past four Super Bowls and won two of those. “I just like underdogs,” said James L. Walkingstick ’21, who rooted for the Rams despite being from Oklahoma. 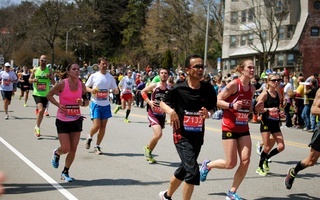 But for others, the question of which team to root for had to do with hometown loyalty rather than unlikely underdogs. Through the first three quarters, the game remained close. The Patriots scored a field goal early in the second quarter, and the Rams eventually tied the game with one of their own late in the third. Brady, however, connected with star tight end Rob Gronkowski for 29 yards to set up a short touchdown run in the middle of the fourth quarter opening the game up. The Patriots were able to hold on for the remaining seven minutes, tacking on one more field goal and stifling all of the Rams’ offensive attempts to mount a comeback. As the two teams squared off, some students made sure they could be in front of a TV. A few minutes before the opening kickoff, more than 30 students swarmed into the dining hall in Adams House, where the game was projected onto a screen, and jockeyed for seats as the national anthem played. At the Cambridge Queen’s Head Pub, students crowded around the bar, surrounded by Patriots flags and banners that hung from the walls. Some entered a raffle in the hopes of winning a Patriots or Rams hat. Students said the watch parties were fun, though some had more fun than others. “It never gets tiring to keep winning,” Kenny G. Coplan ’22 said, as the Patriots held a 3-0 lead in the second quarter. Prateek Pinisetti ’22 had a different opinion on the hometown team. Ultimately, though, some undergraduates said they enjoyed the watch parties, even if their team lost. At Quincy House, Faculty Dean Deborah J. Gerkhe brought bottles of champagne into the house courtyard after the Super Bowl ended, to celebrate the Patriots’ victory. 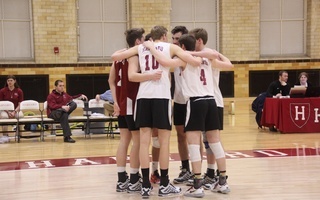 After enjoying the uncharacteristic luxury of air travel en route to an EIVA matchup against George Mason in Washington, DC, the Harvard men’s volleyball team dominated from the moment that it stepped on the tarmac. 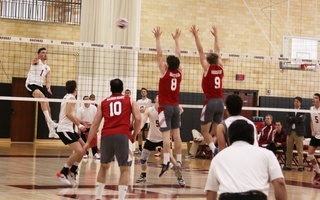 By holding the Patriots to a .047 hitting efficiency, the Crimson earned a 3-1 victory and kept pace with second-place Princeton.